Have you ever ordered broccolini on a pizza? (No.) Is that a ridiculous question? (Probably.) I’m always on the hunt for interesting veggie pizzas, so I’ve sampled no less than three broccolini pizzas at brick-oven pizzerias. Broccolini is a hybrid of standard broccoli and Chinese broccoli, with smaller florets and long, thin stalks. Like all members of the brassica family, it’s awesome once roasted. Hence, pizza potential. First up: I paid an extra three dollars beyond their margherita pizza asking price for the “broccolini” variety. My pizza came out with three broccoli florets scattered on top. It looked like a salad bar hiccuped on my pizza. I still want my three dollars back. Second place: Broccolini was one of several veggies included. While the tips of it were tasty, the stems were way too tough and I couldn’t eat them without the rest of my slice falling apart. Third place: Again, one of several veggies, but broccolini totally stole the show. They had evidently blanched the broccoli before using it as a pizza topping, which softened the stems and let broccolini’s full pizza potential shine. Finally! 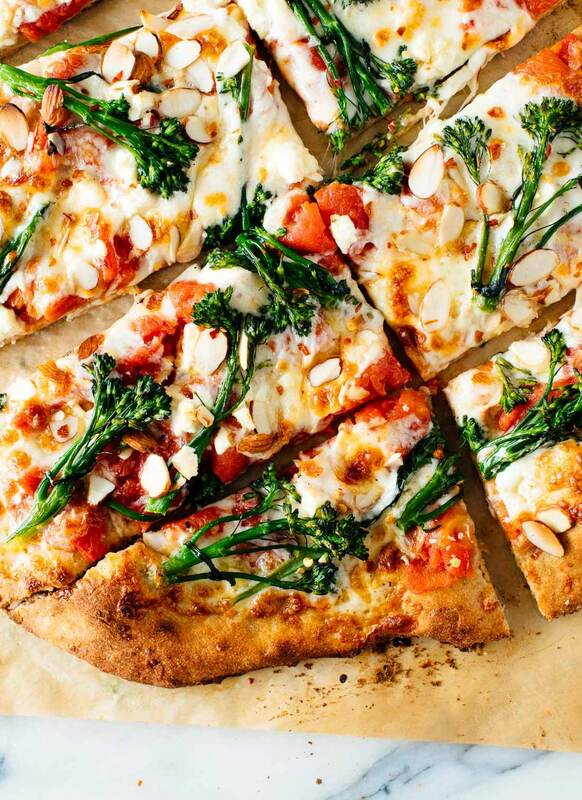 Here’s a delicious pizza featuring broccolini, with some toasty almonds for a savory crunch. You can leave them off if that seems too weird, but—I’m into it. I also included some feta just to keep things interesting. I kept the sauce super simple by just using hand-crushed canned tomatoes, but I love pizza sauce so I regretted not using marinara sauce. Up to you! P.s. 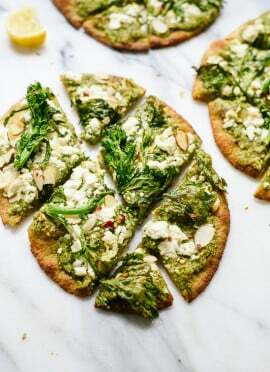 If broccolini pizza isn’t your thing, look no further. Homemade broccolini pizza with almonds (optional), mozzarella and red sauce! The trick to making awesome broccolini pizza is to blanch the broccolini first. I added sliced almonds for a savory little crunch. Recipe yields two 11-inch pizzas or about 4 to 6 servings. Preheat oven to 500 degrees Fahrenheit with a rack in the upper third of the oven. If you’re using a baking stone or baking steel, place it in the oven on the top rack. Prepare dough through step 5. Spread marinara sauce evenly over the two pizzas, or top with drained, crushed tomatoes (crush the tomatoes over the sink to release excess liquid). 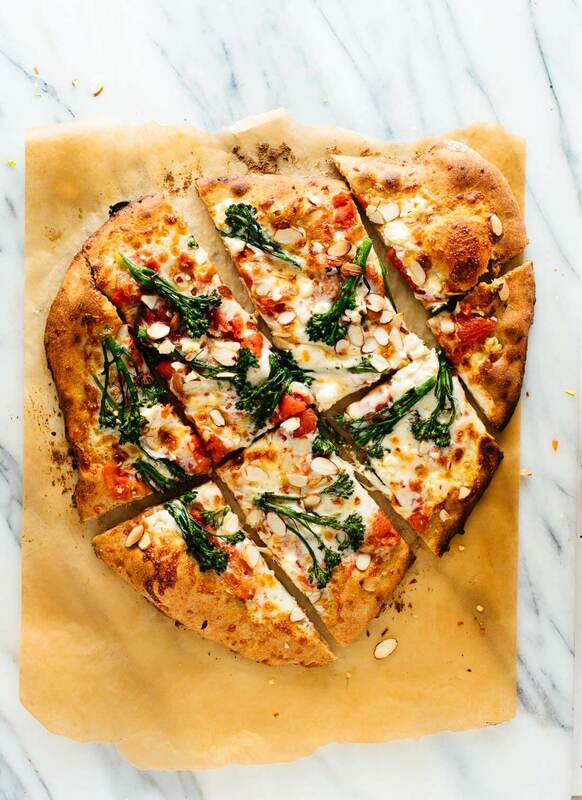 Divide the mozzarella, feta and almonds evenly over the pizzas. To prepare the broccolini, fill a large saucepan with a few inches of water and bring the mixture to a boil. Trim off the tough ends of the broccolini. Cut any stems greater than about ¼″ in diameter in half. 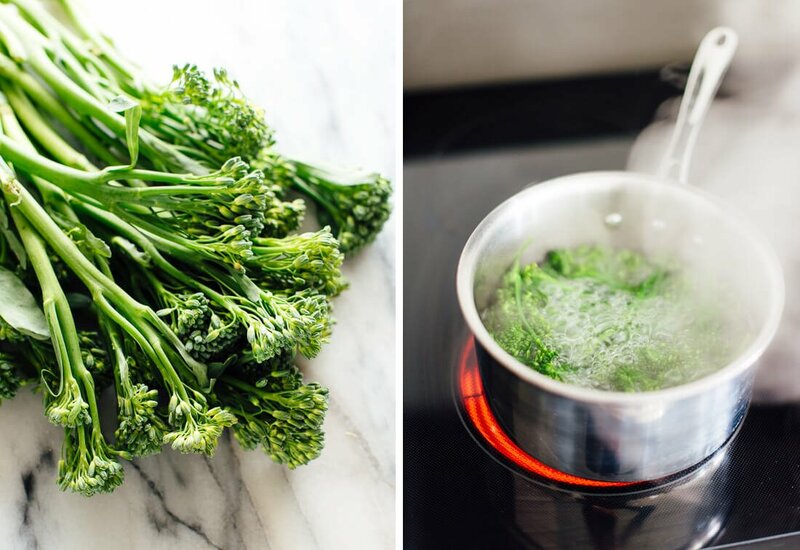 Once the water is boiling, toss in the broccolini, bring back to a boil, and cook for 1 minute. Drain the broccolini and pat dry on a lint-free tea towel. Then, toss the broccolini with about 1 teaspoon olive oil, until lightly coated. Arrange the broccolini over the pizzas and sprinkle the almonds on top. Bake pizzas individually on the top rack until the crust is golden and the cheese is golden and bubbly, about 12 minutes (or significantly less, if you’re using a baking stone/steel—keep an eye on it). 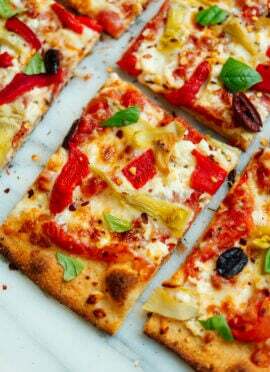 Transfer pizza to a cutting board and sprinkle with with red pepper flakes and fresh basil, if using. Slice and serve! Make it nut free: Skip the almonds! I love Broccolini on pizza! We usually get broccolini and garlic on our pizza at one of our favorite pizza places and it is delicious! So, basically, I can’t wait to try this recipe! Garlic sounds great with this, Sonia! Thanks. 30+ years ago there used to be an amazing pizza place in Cambridge, MA called Bel Canto. One of the pioneers of “adventurous” pizza, its most famous pie was called “In Peppo’s Honor” which consisted of broccoli, walnuts, spicy red sauce and mixed cheeses on whole wheat crust. Looking forward to trying this recipe and seeing if it brings back memories! Oh, I so hope it does, Bob! Let me know how it turns out. So excited to try this! I’m officially on a determined quest to find broccolini at my local grocery store…fingers crossed! Trader Joe s always carries it. What pizza dough recipe did you use? I make artisan bread from scratch (Which is amazing!) and just haven’t mastered a whole wheat pizza dough. It’s always too heavy and stiff, even though I use soft white wheat. This is my go-to recipe for pizza dough, Rosa: https://cookieandkate.com/2013/easy-whole-wheat-pizza-dough/. Let me know how it goes! This looks delicious! I love veggie pizzas! Wondering if you have a recipe for gluten pizza dough. I’ve tried Bob’s Red Mills and it was too potato-y. Trader Joe’s makes a fairly decent frozen GF crust, but it turns into more of a cracker. Would love to know if you have any favorites or could recommend a homemade recipe? LOVE, LOVE, LOVE your site btw. I recommend it to all my friends (novice and home chefs alike). Can’t wait for the cookbook! oops – should read gluten free above. Hey, Sue! Good question. I haven’t yet done my own recipe for GF pizza dough, but I do have my own recipe for whole wheat pizza dough: https://cookieandkate.com/2013/easy-whole-wheat-pizza-dough/. You could certainly try to swap out the wheat flour with Bob Red Mill’s GF blend, though I don’t have experience with doing that. I love anything the Bob’s Red Mill comes out with, so you could try their version of a GF Pizza Dough mix, too. Let me know if any of that works! I have never had broccolini on pizza, but I love to have nuts on pizza, yum! I can’t wait to try your recipe! Omg this sounds really good! 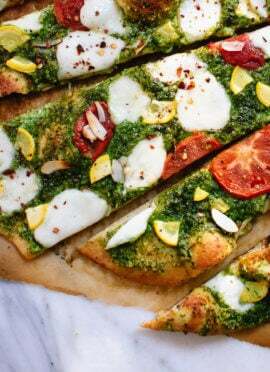 Love veggie pizzas that experience with some particular engridients so will definitely try this ! Recently had broccolini for the first time, steamed, then chilled, with a dressing, and it was quite tasty! Will definitely try this recipe! Thanks! Thanks, Kris! Hope you love the pizza. I’ve been loving broccolini lately. Yum! I am going to use Kite Hill’s almond ricotta instead of feta and Miyoko’s Kitchen VeganMozz to make it vegan. I am excited about this beautiful recipe! Let me know how it goes, Stephanie! 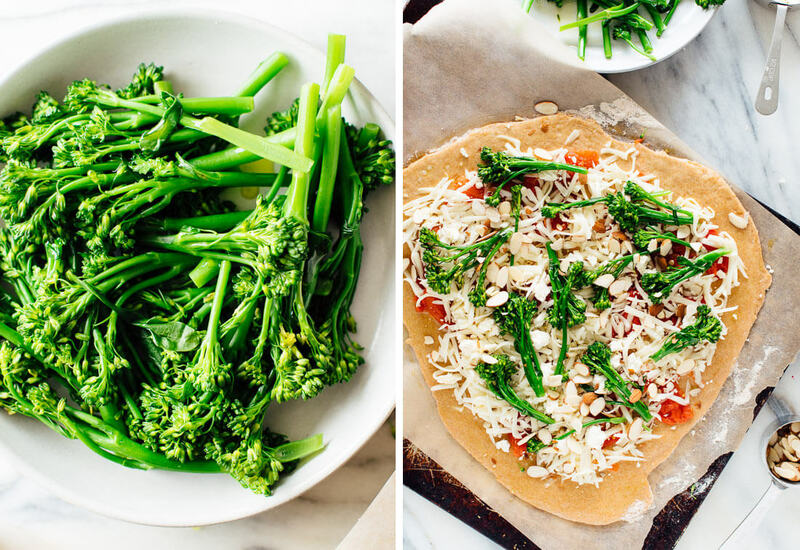 Yes – I use broccolini on my pizza! Brussels sprouts, roasted butternut squash, zucchini, etc. You name it! All yummy! I love it– so crunchy and fresh! Going to throw some broccoli on my next pizza, if I put nuts on it though, my dog will want a bigger share of it. I hope you try it, John! I commend you for how you kept trying broccolini pizza even after so many disappointments. This sounds fantastic- I’m absolutely trying this for my next pizza night. Persistence pays off, friend! I hope you enjoy it– let me know how it goes! Pizza and broccolini, 2 of my favourite foods. Cavolo nero/Tuscan kale is also delicious on pizza and you can roast it but I prefer to saute the kale in olive oil, garlic and chilli flakes then scatter on the pizza when it comes out of the oven, I recommend it. Thanks for sharing with us your recipes.I made it yesterday evening and came out perfectly.keep it up. we love your blog. I was nervous about making this because I have had some traumatic experiences with yeast (think loaf of bread like hockey puck) and also with pizza dough (you know the kind that keeps shrinking back into a ball? ), but it all worked out beautifully. Love the idea of nuts on pizza. Thanks so much for another recipe! This pizza was SO delicious !!! Putting it on my favorite list next to your cauliflower and lentil tacos! Great! So glad you loved the pizza, Christine. We call it tenderstem broccoli here in the UK. it is rather good and that pizza looks amazing. Pinning this for later. The pizza looks great and I think I’m going to give this a try. Thank you! I hope you do, Megan! Let me know how it turns out. I made this pizza the other night and it was oh so delicious! I’ve never purchased broccolini before. It works so much better than regular broccoli. I like the smaller pieces for topping a pizza with. The almonds added a nice crunch as well! Simple and super tasty. Made this tonight, and it was fantastic! I added sliced black olives, shiitake mushrooms and artichoke hearts and it was so good. We hardly have any leftovers! Yum! Sounds salty and toothy. This is a new favorite veggie pizza. I used a little less marinara sauce and chopped up whole almonds for the topping instead of using sliced. Delicious! Thank you, for another great review Hannah :) Happy you are enjoying so many of my recipes! Absolutely delicious! My family made this for me for Mother’s Day last night. I highly recommend it! That’s great! Thank you, Kristen for sharing. I appreciate the review.